Flutes, Voice, Didgeridoo, Percussion, Tibetan Bowls, Gongs, Shells, Shakers & Keyboards. Bring a yoga mat, blankets, pillow, eye mask, water bottle, etc. to make yourself comfortable. No Scents or Perfume Please. A SOUND HEALING JOURNEY is a unique experience designed to safely guide you in connecting with your deepest self. It’s a sacred journey using sound for healing and rejuvenation. Sound immersion is a powerful form of meditation. Whether resting in Sivasana (laying down) or comfortably seated, the vibrations resonate your body and bring you into harmony with yourself. It is a form of restorative yoga that promotes physical, mental, emotional and spiritual well-being. 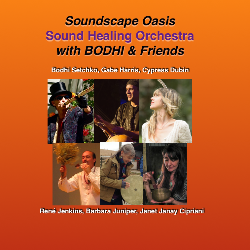 René Jenkins is a professional musician, Ceremonial Sound Practitioner, Healing Performance and Recording Artist from Sonoma, California. For more than 25 years, René performs sound healing concerts, blessings and ceremonies for individuals and special groups across the country. While embracing the ancestral wisdom from cross-cultural anthropologist Angeles Arrien, Kashaya-Pomo elder/healer Lorin Smith, and renowned South American sound healer/musician Tito La Rosa, René raises consciousness-vibration through Sacred Sound and Intention. Barbara Juniper has worked in the field of alternative healing and transformation for over 20 years. She is a longtime member of Sukhasiddhi Foundation who is a singer, musician, songwriter and sound healer. 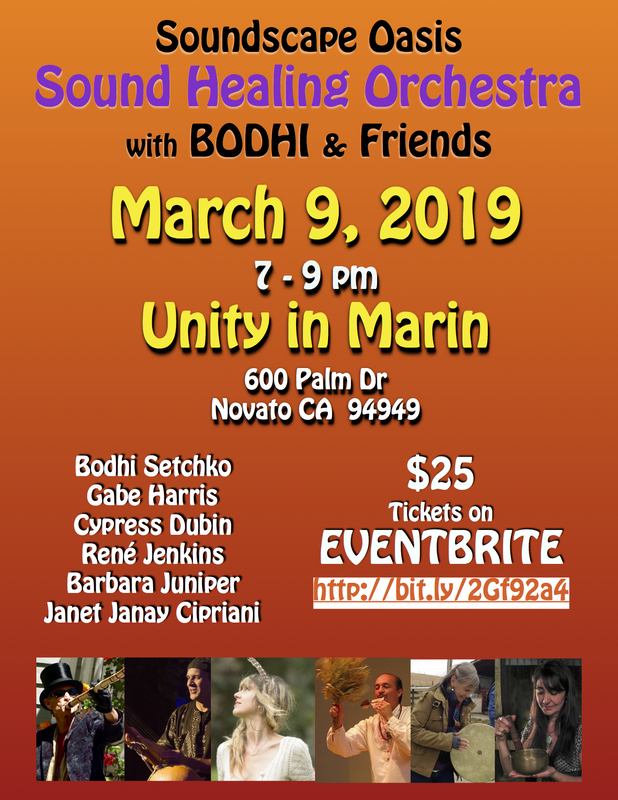 She has shared her musical offerings with many different artists in many bay area venues as well as having a private sound healing practice in Marin. Janet Janay Cipriani is a Certified Angel Therapy Practitioner® and has a healing practice in Sonoma, CA called Divine Connections. An amazing clairvoyant and clairsentient, Janay is an intuitive, medium, sound healer and Angelic Reader who uses her gifts to offer guidance, insight, and energy healing.